Sn0wbreeze, the famous tool for Windows, will be released towards the end of this week. Sn0wbreeze is the software that will allow users to create custom firmwares to use for jailbreak and unlock. Now this functionality is available for Mac OS usera with PwnageTool. iPhone is normally used to make calls, or at most to play. But we alway see different experiments with the iPhone involved in driving a vehicle or integrated into a robot. Today we show you how the iPhone is able to command a small rocket through an application and some special hardware! This Missile Launcher is based on an eBox running customized Windows CE 6, it launches model rockets to 200 feet. Everything is iPhone controlled (orientation, deviation and firing). This application has no real value and is therefore directed more to jokes. Just make friends think that you have installed a lightweight version of Windows on the iPhone. Wow! Wind Os is avaliable in AppStore for $0.99 (link). 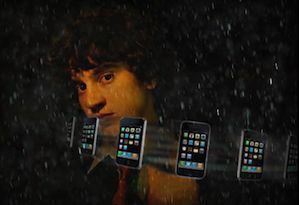 Media research firm Nielsen released its lists of top U.S. mobile phones, sites, and brands for the first ten months of 2009. The iPhone 3G took the top spot among mobile phones with 4.0% of the market. 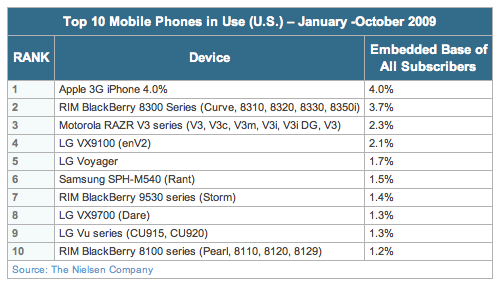 The iPhone placed slightly ahead of Research in Motion's BlackBerry 8300 series at 3.7%, and well ahead of the remainder of the pack, which was led by Motorola's RAZR V3 series at 2.3%. Apple also made an appearance on Nielsen's list of top ten brands accessed via mobile networks for the January-September 2009 timeframe, taking tenth place on a list topped by Yahoo! and Google. iH8Sn0w has posted another teaser trailer for Sn0wBreeze, a windows utility to build custom iPhone ipsw files. iPhone Explorer is a handy application for Mac and Windows. It allows users to use a USB connection and access all the system files. 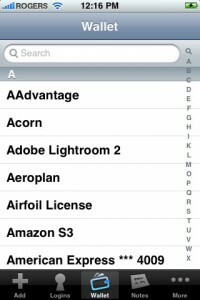 Users can create, delete and rename files and folders on iPhone or iPod Touch, or use the device as a flash drive. If you have a jailbroken device can gain access to the root directory. The functionality is somehow similar to iFunBox and iPhone Folder applications. The application is completely free and you can download it from here. 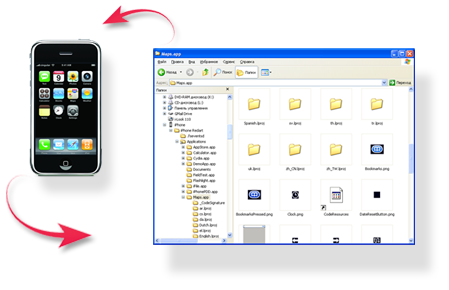 iPhone Folders is a Windows Explorer extension that allows you to browse contents of your iPhone or iPod Touch like a regular removable drive. After installation you'll find it in My Computer folder. Using this extension you can browse your phone filesystem, copy files to and from it, open files directly from iPhone, create shortcuts to folders on iPhone. In thumbnail mode program will display previews of png and jpg files on phone, application icons for installed applications (.app folders). Compatible with x86 editions of Windows XP, Vista, 7 and x64 editions of Windows XP and Vista. Requires iTunes 8 or 9 for normal operation. Supports jailbroken and non-jailbroken phones (in the later case filesystem access is limited to Media folder). You can download iPhone Folders version 1.0.31 here. 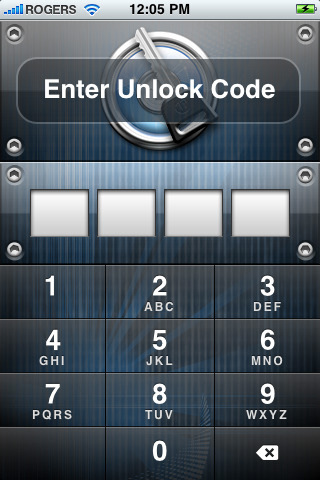 Agile Web Solutions is offering 1Password Pro free until December 1st for iPhone and iPod touch users. 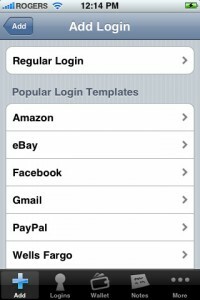 1Password will securely store your important information and can automatically log you into websites with a single tap. There's no need to remember the username, password, or even the website address. 1Password Pro is normally $7.99 and can be installed from the AppStore (link). 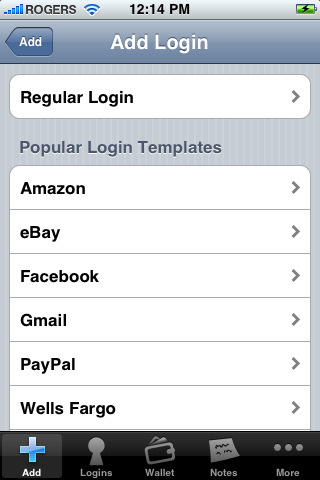 (pro) Special easy switching mode allows you to quickly copy-and-paste usernames and passwords to Mobile Safari. (pro) Support for copying multiple field values (for example, both username and password) from 1Password to Mobile Safari. (pro) Features coming soon: Favorites, MobileMe/WebDAV syncing, and more. Data Backup & Restore option available on Mac, Windows and Linux. "The issue is more with Apple than with us because they control the App Store and because they refuse applications which compete with something that is already on the phone. 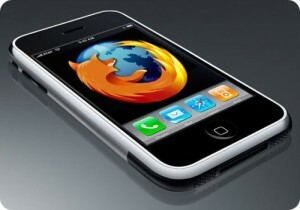 It’s unlikely that we’ll see a version of Firefox running on the iPhone"
As for Firefox Mobile, it will be launching on Symbian, Android, Windows Mobile, and Nokia Maemo tablets in December. Here's a new video preview of Sn0wbreeze, the iH8sn0w's Windows tool that will be able to create a custom firmware, just as PwnageTool Mac. In the video we see a preview of the graphic interface and the first functions. At startup we choose the expert or the simple mode and the rest should be exactly as we know it already. Many users are unable to sync their iPhones on PCs equipped with Windows 7 and Intel P55 Express chipset. Gigabyte is the first company who fixed this issue. They've released a beta BIOS that addresses the problem. Asus and MSI, which also use the P55 express on their motherboards, haven’t issued any updates yet, but hopefully will soon. Geohot has released his BlackSn0w utility. BlackSn0w is an unlock for the iPhone 3G and iPhone 3GS. It supports the latest firmware 3.1 and 3.1.2 with baseband 05.11.07 and enables official tethering. Available for both Windows and Mac. If you havn't done the jailbreak: go to blackra1n.com, download blackra1n, run it, follow the instructions (it is really simple) to perform the jailbreak. Run balckra1n app on iPhone and install BlackSnow. If your device is already jailbroken - run Cydia, add repository blackra1n.com and install blacksn0w. That's it! The latest version of blackra1n is RC3. It now has hacktivation support, 15 second speed improvement, Tiger+PPC support. PS: If you just bought a new iPhone 3GS or have one that was made recently (approximately after 40th week after iPhone 3GS release): your device has a new BootROM. Unfortunately it is impossible to run regular jailbreak with this new BootROM. There is a sloution - tethered jailbreak. Everything including unlock will work fine. However every time you restart your iPhone, you need to plug it to a computer with blackra1n installed. 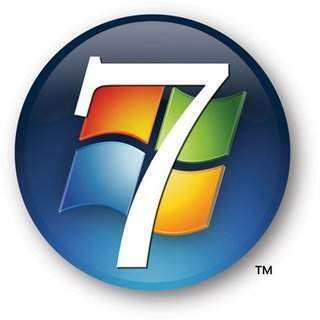 Microsoft Windows 7 will probably be a very popular OS. iPhone is already one of the most popular phones. So compatibility between the two is expected, right? Well, many users report in Apple forums that they get "error 0xE8000065" message whenever they attempts to sync. The problems might be in Intel P55 Express chipset's USB controller. We hope that either Intel or Microsoft will find a solution. 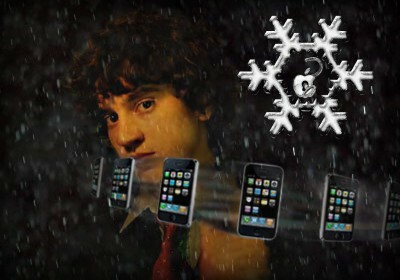 iPhone OS hacker, GeoHot, released Blackra1n RC2 today, an updated jailbreak utility for the iPhone 3GS and iPod Touch. You can download BlackRa1n here.